Cover-More has been protecting the travel dreams of Australians travelling domestically and internationally for 30 years. Cover-More Group provides travel and rental car excess insurance to 18 million travellers worldwide. While we have strong relationships around the world to provide global support for our policyholders, our emergency assistance operations are based in Australia. It’s one of the things about Cover-More we’re proud of here. We don’t outsource our emergency assistance, so when you call you’ll be talking with people who know your policy. Voted by Australians to help showcase the best travel insurance in the country, this award was granted to highlight Cover-More’s outstanding customer service. After examining over 60 different travel insurers, Mozo awarded Cover-More for its two premium travel insurance products, which offer customers high levels of both protection and policy benefits. Cover-More Group was acquired by Zurich Insurance Group in April 2017 and Zurich Australian Insurance Limited, will become Cover-More’s underwriter in Australia from 1 June 2017. 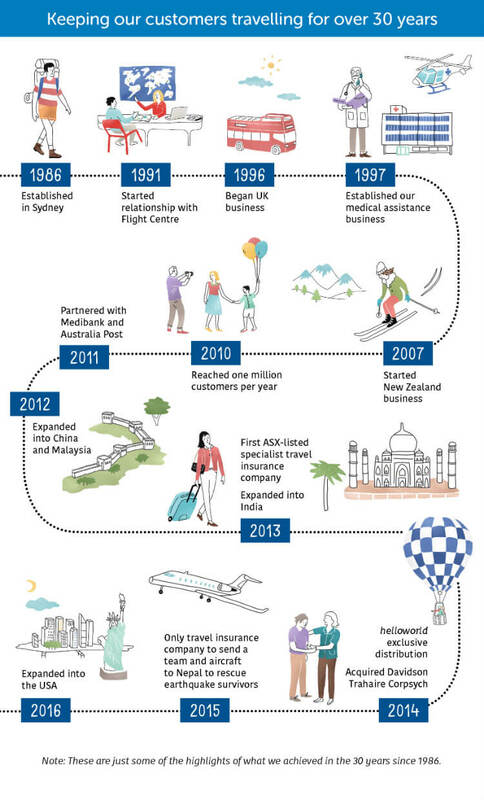 With Cover-More’s market share of approximately 40%* of the travel insurance business in Australia and the Zurich Insurance Group’s global expertise around the world, it’s a strong position to be in and one we intend to grow further. * Figures current as of 2015 per the Finaccord. Market Report: Travel Insurance and Assistance in Australia 02/2016.